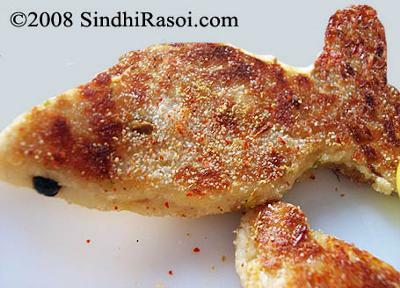 Enjoy this Vegetarian Fish with rings of onion, tomato slices, chutney/sauce. Boil Arbi with enough of water and 1 teaspoon of salt till 2 whistles of pressure cooker (or if in pan, boil them till cooked). Peel and mash the arbi,and add bread crumbs, salt, ginger garlic paste,green chilli paste and tamarind paste or lemon juice. Mix very well, if the mixture is sticky, apply some water or oil. Take a small portion of this mixture and shape it into FISH LIKE shape (or you can give any shape you like). Place black peppers in place of “eye”. Coat with Rava and shallow fry till light golden. Sprinkle some “chaat masala”, red chilli powder and amchur (dry mango powder).